This post was originally posted at APTA.org but was permitted for re-publication at TheManualTherapist.com (in conjunction with ForwardThinkingPT.com) in an effort to create further awareness to PTs about APTAs efforts. APTA is committed to the triple aim of health care. The association’s proposed coding reforms are just one way—but an important one—of achieving it. Achieving the triple aim while respecting the needs of different stakeholders can’t happen in a single bound. With various models being proposed and tested, it will take a combination of several of them, and in staggered steps, to move toward the goal. When the writing was on the wall—or, rather, contained in the Affordable Care Act of 2010 (ACA)—APTA began acting to prepare physical therapists (PTs) and physical therapist assistants (PTAs) for coming changes. The association has launched a coordinated approach to help ensure that as health care moves toward meeting the triple aim, PTs are recognized and paid for their judgment and clinical decision making—and not solely for the procedures they perform. To bring you up to speed and to connect the dots with other payment trends that are contributing to the transition from the fee-for-service model and toward value-based payment, here are 5 things to know now about payment reform for physical therapist services. 1. The proposed CPT coding changes are connected to other efforts that all are part of overall reform. Data generated from quality programs will help payment evolve into an episodic or bundled payment model that most people believe is the ideal model to meet the triple aim. Without good data, however, it will be hard to develop episodic models that hold providers accountable for their services. This is where another significant APTA reform initiative fits in: the Physical Therapy Outcomes Registry. Once it is in widespread use, the registry will help provide the profession with key information, such as number of visits for certain episodes and patient complexity patterns. Standardization in reporting data is crucial to its effectiveness in comparing service quality. For that reason, another area of payment reform that APTA is monitoring is postacute care. The association supported the Improving Medicare Post-Acute Care Transformation (IMPACT) Act of 2014, which calls for standardized quality reporting across the different types of hospitals. Finally, APTA continues to seek an end game on repeal of the therapy cap by replacing it with payment reform provisions. The latest extension of the exceptions process through calendar year 2017 must be the last, and the therapy cap must be repealed. 2. CPT codes by design evolve, and the proposed physical therapy codes aren’t meant to remain exactly as they are now. The proposed evaluation and intervention codes aren’t intended as the final word. They are meant to be incremental steps in a transition period from fee-for-service to, ideally, an episodic payment model. It’s not an unusual concept; this happens to CPT codes in general. In fact, 1 purpose of the CPT coding system is to evolve as practice evolves so that it best represents the services being provided. Numerous CPT codes are submitted to be revised or enhanced almost every year. Similarly, physical therapy codes shouldn’t solely be based on time. The amount of time a PT spends with a patient doesn’t necessarily reflect the complexity of the patient’s condition or the intensity of the PT’s clinical judgment for evaluation or treatment. Consider spinal manipulation: It’s a brief procedure but requires a high level of judgment and skill. Another scenario is a patient with severe impairments; the PT may treat for a short amount of time because the patient can’t tolerate a longer session. In such a case, the PT makes that judgment so as not to injure the patient further. On the other hand, a young athlete with a simple ankle sprain might tolerate longer sessions, but the treatment is routine. 3. It’s impractical to leap directly from the current fee-for-service model to one of episodic payment. As much as APTA and other stakeholders want to reach the “gold standard” of an episodic payment model, it can’t happen overnight. 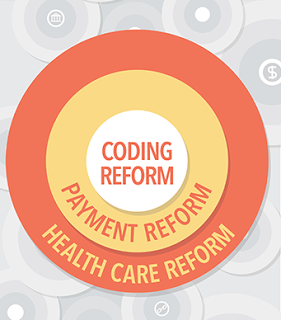 Remember item 1: Coding reform must work in tandem with other activities that are moving the profession toward payment and health care reform. All the pieces must be in the right place at the right time. Moving 1 piece too far ahead won’t speed the process if the others aren’t in place. CMS doesn’t yet have the data to support episodic models specific to physical therapy. Pilot programs, such as the Comprehensive Care for Joint Replacement Model (CJR, sidebar on page 32), are testing the waters. Private payers also are testing models. Consider this analogy: The CPT coding system is the plumbing and wiring of health care services. The other pieces of health care reform—quality measures, patient outcomes, patient and provider buy-in—will build on that infrastructure as the mechanisms for obtaining information evolve and needed data is collected. Meanwhile, though, the infrastructure still is needed for reporting the services being provided right now. To continue the analogy, the plumbing and wiring must match the equipment and technology currently being used in the building. Say you purchase a “super galactic cloud interface” (yes, we just made that up) for your communications, but your building is wired for a standard phone system. You’ve not only spent money on something you can’t use yet, but your current phone now won’t work. Remember item 2: Coding systems by design evolve as needed. The proposed CPT codes are intended to move the profession as far forward as it is now ready to go. The codes can be revised when more change is warranted. 4. If we do nothing, CMS will do something for us, and we may not like it. Holding off on any initiative is risky. For example, APTA is closely monitoring the CMS initiative to review potentially misvalued CPT codes. ACA requires the agency to identify, in its annual physician fee schedule rules, “potentially misvalued” codes—codes whose values may no longer be appropriate and that will be reviewed to see if their values need to be adjusted. Ten physical therapy codes (among 103 total) are on the misvalued codes list for 2016. While it’s possible that only a handful of the codes would actually be revalued, any of the codes in the Physical Medicine and Rehabilitation family—the 97000 codes—could be subject to the review, since they’re associated with the 10 codes on the list. Coding reform, once new codes are in place, would nullify any value changes from the review, since the old codes would be removed, and values would be determined for the new codes that replace them. As the physical therapy profession’s standard-setting national association, APTA has the responsibility and expectation of being at the table as decisions are made that will affect future practice and payment. We must not be on the outside looking in. 5. A united front from the profession will move us along much faster and more effectively. Payment reform is not an “APTA thing.” It is a commitment to position the physical therapy profession for the future of health care. The profession is diverse, and APTA understands that the payment system must fairly serve all care settings, from community-based private practices to corporate health care systems. We are in ongoing open dialogue with members and stakeholders to ensure that we are a community of professionals working together. Showing a united face is the best way to positively influence the policy makers who ultimately will determine the fate of coding proposals for physical therapist services. It’s how we demonstrate the value of physical therapy in meeting the triple aim of health care. Miller H. The Building Blocks of Successful Payment Reform: Designing Payment Systems That Support Higher-Value Health Care. Payment Reform Series No 3. Network for Regional Healthcare Improvement, Center for Healthcare Quality and Payment Reform, Robert Wood Johnson Foundation. April 2015. Got Questions? APTA Has Answers. Why is APTA developing a new coding system? Increasing regulatory and legislative burdens on physical therapy providers spurred APTA to more aggressively pursue alternative payment and coding methods to help reduce and prevent policies such as the multiple procedure payment reduction (MPPR). In addition, the government and leading policy groups had been discussing necessary reforms to therapy payments under federal programs. When CMS released its proposed rule for the 2011 physical fee schedule, it outlined 3 short-term approaches to address the therapy cap, one of which was the introduction of a per-session coding system. In June 2013, the Medicare Payment Advisory Commission report included payment reform recommendations for physical therapy under Medicare. At the same time, APTA recognized that the health care system was in the process of transitioning from a system based on the volume of services to a value-based system. Revising the physical medicine and rehabilitation codes from a procedural-based system to a per-session coding system is a step toward positioning physical therapy as an integral component of the new value-based health care system. What are the benefits of moving from a procedural-based coding structure to a per-visit structure based on severity of patient condition and intensity of services provided? The new per-session codes will better describe the work and elements of clinical practice involved in providing physical therapy services because they will reflect the severity of the patient’s condition and the intensity of the services provided. Per-session codes could reduce challenges associated with edits, such as correct coding initiative edits and MPPR. Has the Centers for Medicare and Medicaid Services (CMS) proposed a new payment system for outpatient physical therapy services under Medicare? Not at this time. In 2014, however, CMS was charged with identifying misvalued codes and reducing reimbursement to meet certain budgetary goals. In the 2015 proposed fee schedule rule, CMS identified several physical medicine and rehabilitation codes as being misvalued, including codes 97032, 97035, 97110, 97112, 97113, 97116, 97140, 97530, and G0283. CMS also has issued several reports, such as the Development of Outpatient Therapy Payment Alternatives (DOPTA) and the Short Term Alternatives for Therapy Services (STATS), that discuss potential future options to consider for alternative payment for therapy services. Is APTA engaging in discussions with CMS regarding the new coding system? Yes. CMS has a seat on the American Medical Association’s (AMA) Current Procedural Terminology (CPT) Editorial Panel, as well as the Relative Value Update Scale Committee Health Care Professionals Advisory Committee Review Board (RUC HCPAC), and is aware of proposed changes to the physical medicine and rehabilitation codes. APTA has met with CMS on several occasions to update the agency on the progress of the new coding system and incorporate CMS feedback. In addition, APTA has engaged commercial payers—both individually and at the association’s annual Payers Forum, and continues to do so on a regular basis. What other associations are collaborating with APTA on changes to the system? Why hasn’t APTA released the proposed CPT codes and coding language for the new system? The proposed codes are proprietary to the AMA and subject to strict confidentiality rules. CMS will release the language for the evaluation and reevaluation codes and their proposed values this summer in the CY 2017 Physician Fee Schedule Proposed Rule. This timing is common for new or revised CPT codes. What changes will I need to make in my practice to implement the new CPT codes? Physical therapists will need to be trained on the new coding system. Electronic medical records (EMR) also will need to be updated to incorporate these new codes. APTA will conduct an extensive educational campaign when the new physical therapy evaluation and reevaluation codes are published by CMS to ensure that all physical therapists are prepared for implementation in 2017. Members should continue to check the PTCPS webpage for more information. We do not know. APTA’s goal is to obtain the best value possible for the new codes, but we will not know the impact on payment until the codes have passed the AMA CPT and RUC process and have been valued by CMS. How will value and outcomes be measured for my patients under this new system? The new coding system does not measure outcomes on its own. It will need to be paired with outcomes measures. This is similar to the current code set in which quality or outcomes measures are applied to the payment system. The coding language does, however, incorporate use of standardized tests and measures to help the physical therapy profession begin to report standardized data elements. This will enable outcomes, and ultimately the value of physical therapy, to be measured more uniformly. Please note: The information provided is offered for general informational purposes only. It is not offered or intended, nor should it be relied upon, as legal advice. Legal doctrines, statutes, and case law vary from state to state. You should consult with your own attorney for specific legal advice on particular legal issues. The Comprehensive Care for Joint Replacement model (CJR) is being tested as a new way to pay for episodes of care initiated by hospital stays for lower extremity joint replacements. Under CJR, hospitals will be at financial risk for care provided during the initial hospital stay and for 90 days after discharge from the hospital. The model was implemented in select locations on April 1, 2016, and will be tested for a 5-year period. APTA is supporting members in their success within this model by providing resources, which are described on a dedicated webpage—www.apta.org/CJR. There, you’ll find APTA’s summary of the Centers for Medicare and Medicaid Services ruling that mandates the program, APTA’s comments on it, and a link to the webinar APTA developed that explains CJR, identifies key factors that may influence your decision to join a model program, and describes changes you may need to make to your practice operations if you choose to participate. CJR is just 1 example of bundled payment models—also known as episode-based payment or case rates—that have been proposed as a way to encourage coordination across providers and to promote more efficient care. Read more about them at www.apta.org/bundledmodels. Have a question regarding CJR or payment bundles? Email advocacy@apta.org.